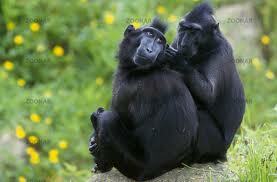 The Celebes crested black macaque is found only in Indonesia – primarily on the island of Sulawesi. 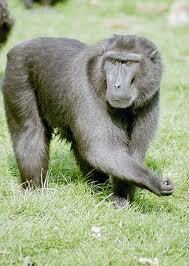 There are about 20 species of macaques, consequently, they have been divided into five species groups. 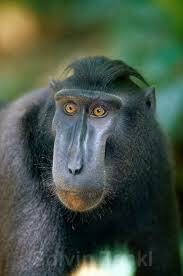 The Celebes crested black macaque is in the silenus group (along with the liontail macaque). Not much is known about them. They do have a rather long and complicated taxonomic history having been renamed on any number of occasions. They eat, primarily, fruits, flowers, insects, and eggs. They have long, baboon-like faces with deep grooves on both sides of the snout and prominent brow ridges which enhance their resemblance to baboons (although to me they look more like drills). The tails are short and the intermembral index is 92 (the intermembral index is a comparison of forelimbs to hindlimbs. Lower indexes equals longer hindlimbs, while higher indexes indicate longer forelimbs. Intermediate values indicate the forelimbs and hindlimbs are roughly equal in size), and the nostrils are small and slitlike. 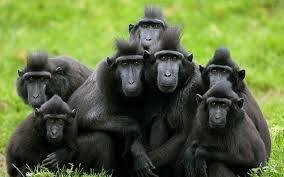 Like most macaques, they live in groups with males migrating and dominance being determined by matrilines. I wonder if they swim like long tail macaques, or float or stay out of the water entirely.